Cannabis is the last thing you might think of when looking to curb alcohol or cocaine cravings. However, a study published in Nature, suggests that cannabidiol (CBD) may indeed be useful in this rather difficult endeavor. People who were previously addicted to drugs and alcohol often struggle to stay abstinent, with some days being more difficult than others. This becomes especially difficult when they are under high levels of stress and anxiety, or find themselves in drug-related settings where they can easily be offered alcohol or cocaine. The research team, led by Friedbert Weiss at the Scripps Research Institute in California, tested the effects of a non-psychoactive and non-addictive ingredient in the Cannabis sativa plant (marijuana) on drug relapse in rat models. In the study, the team applied a gel containing CBD to the skin of lab rats, once a day for one week. The animals had daily alcohol and cocaine doses before the experiment, which led to addiction-like behavior. The team then tested the stress and anxiety responses of the rats, as well as their impulsive behavior, which is a psychological trait associated with drug addiction. The findings of the study revealed that the rats administered with CBD showed reduced signs of relapse into addiction, even when they were exposed to stress or drug cues. Three days after completing the therapy, the team discovered that the CBD was cleared entirely from the brain and plasma of the rats. The researchers were further surprised to find that five months after the therapy, the experimental animals that had been treated with CBD continued to show a reduced relapse induced by stress or drug cues. 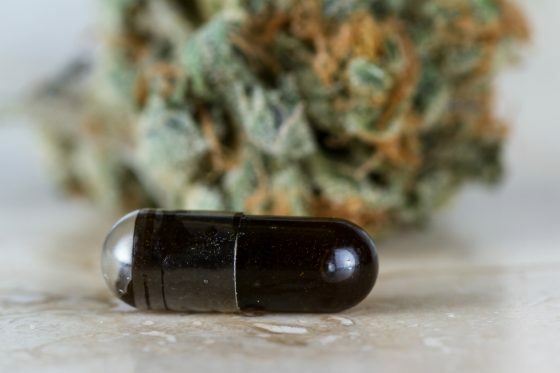 The findings highlight the possible medical benefits of non-psychoactive cannabinoids, and how they may be used to help reduce the relapse among drug and alcohol addicts in rehabilitation. The team believes that the findings may provide an insight into the mechanisms of CBD that cause such effects and how it can be utilized in the pharmacotherapeutic prevention of drug relapse. “The efficacy of the cannabinoid [CBD] to reduce reinstatement in rats with both alcohol and cocaine – and, as previously reported, heroin – histories predicts therapeutic potential for addiction treatment across several classes of abused drugs,” said Weiss. CBD is the primary non-psychoactive ingredient of C. sativa, meaning it does not produce a “high” feeling or change a person’s state of mind. CBD is an entirely different compound from THC (tetrahydrocannabinol), which is another type of cannabinoid that induces a “high” feeling by activating the brain’s reward system. Because of CBD’s non-psychoactive activity, it has been used to treat pain and has been considered as a possible treatment for certain neurological and psychiatric conditions. A study published in Neurotherapeutics found that CBD inhibits the absorption of anandamide, a compound associated with regulating pain. This means that increased levels of anandamide in the body may reduce the amount of pain a person feels. Another study by the National Academy of Sciences also found CBD to help in treating nausea and other side effects from chemotherapy. It has also been used to manage muscle spasms caused by multiple sclerosis. Cannabis is legal in 29 states for medical use, and nine states for recreational use, but remains illegal under federal law. Learn more about the uses of cannabis in healthcare at CannabisCures.news. Contributed by Janine Acero of NaturalNews.com.